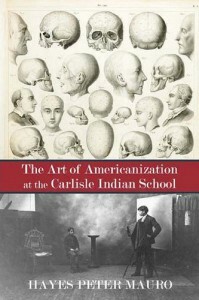 Hayes “Pete” Mauro, MA Art History ’01 just released a new publication The Art of Americanization at the Carlisle Indian School. “Established by an act of Congress in 1879, the Carlisle Indian Industrial School in central Pennsylvania was conceived as a paramilitary residential boarding school that would solve the then-pressing ‘Indian Question’ by forcibly assimilating and Americanizing Native American youth. A major part of this process was the ‘before and after’ portrait, which displayed the individual in his or her allegedly degenerate state before Americanization, and then again following its conclusion. In this historical study, Mauro analyzes the visual imagery produced at the Carlisle Indian Industrial School as a specific instance of the aesthetics of Americanization at work. His work combines a consideration of cultural contexts and themes specific to the United States of the time and critical theory to flesh out innovative historical readings of the photographic materials. The publication is available online at several sites including amazon.com.